For some reason, it seems like dads are the hardest people to pick out gifts for! I solved this issue early by figuring out what I was going to do for Father's Day a couple of months ago when my dad was raving about a chimichurri sauce served with dinner at an Argentinian client's home. I wanted to make a big batch of it myself to give him! 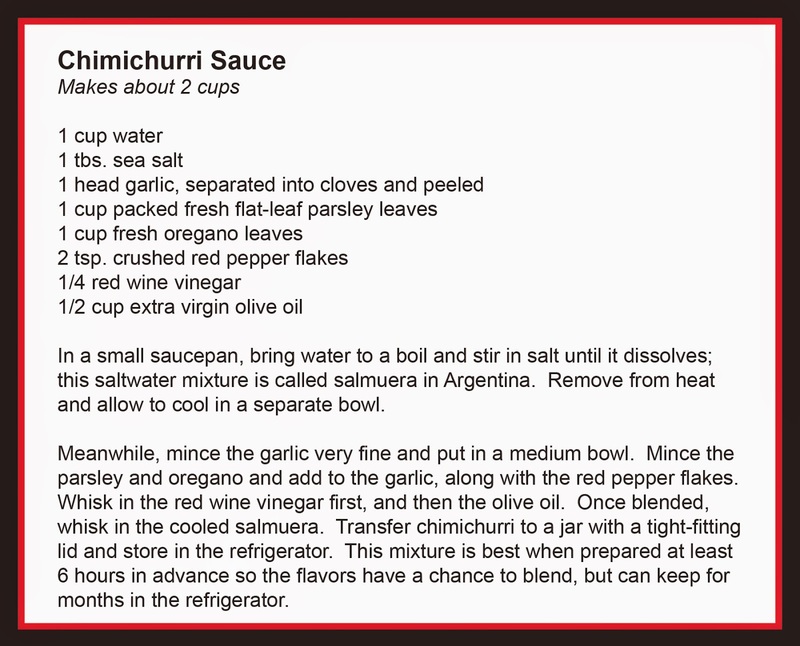 In case you don't know, chimichurri is a very salty green sauce made with fresh oregano, parsley, garlic, olive oil, vinegar, red pepper flakes. It's not used as a marinade, but as a dipping sauce for grilled meat, especially steak and pork; it went perfectly with the grilled pork tenderloin we made for dinner that night. 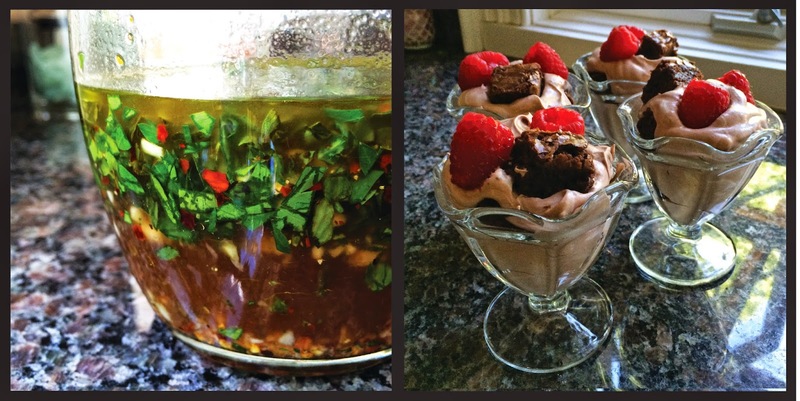 For dessert, I made a chocolate raspberry trifle filled with moist brownies, chocolate mousse and fresh raspberries. Summer cooking can't get much better! I started by bringing 1 cup of water to a boil and stirring in a tablespoon of sea salt; set this aside and let the water cool while you chop all of the herbs. I minced fresh oregano, flat leaf parsley, and a full bulb of garlic as finely as possible, and placed them in a medium bowl. I added a generous portion of red pepper flakes (about 2 tsp.) because my dad loves a kick to his food! I whisked in the red wine vinegar, and then the olive oil, into the herbs. Make sure to add these one after the other rather than at the same time so the vinegar has a chance to soak into the herbs and garlic before the olive oil goes in. Once the water is cooled, or close to cool, whisk it into the mixture. It's that easy! Transport the mixture into a mason jar or air-tight container. This step is essential if you want the chimichurri to stay fresh over time. It looks gorgeous in the container! ...but it looks even more beautiful accompanied by a grilled pork tenderloin! Yummmmm. This is honestly one of my favorite desserts, partially because I love anything that involves brownies, and partially because it's so easy to make and a TOTAL crowd pleaser. 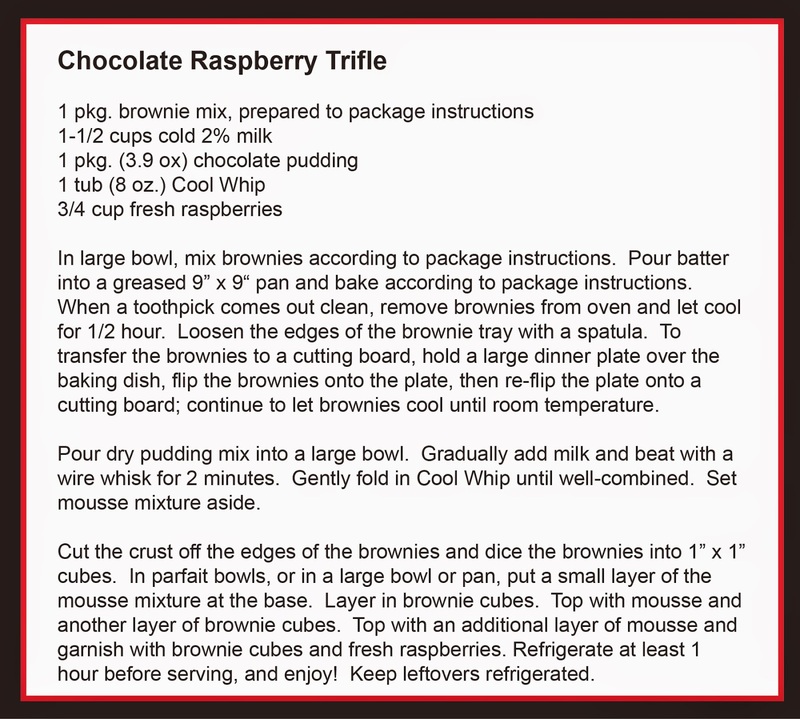 I started by preparing a boxed brownie mix according to the package instructions. I always like to pick out the brands that have the fudge pack included because they taste sooo good! I baked the brownies in a 9" x 9" baking dish sprayed with nonstick cooking spray for the time suggested on the package. Feel free to use an 8" x 8" if you don't have the other size. After the brownies had a chance to cool for a half hour or so, I transferred the brownie sheet to a cutting board so they could cool faster. I did this by loosening the edges of the brownies with a spatula, holding a large dinner plate over the baking dish, flipping the brownies onto the plate, then re-flipping the plate onto a cutting board. As long as you use the cooking spray, the brownie sheet will come out pretty easily. Now it's time to make chocolate "mousse," without all the hassle and fancy ingredients that mousse requires. All you need for this mousse is a small box of Jello-brand chocolate pudding, 1-1/2 cups of 2% milk, and a tub of cool whip. I placed the pudding mix into a large bowl and gradually whisked in the 2% milk until the pudding was smooth and started to thicken a bit; it took about 1-2 minutes of stirring. Then I gently folding the cool whip into the pudding using a spoon until it formed a well-blended, fluffy chocolate mousse. Time to assemble the desserts! I cut the crust off of the edge of the brownie and set these aside. You'll need these in about 10 minutes after you assembled the dessert and still have some of the mousse mixture left. Gotta scrape the leftovers off the bowl somehow! I cut the crust-less brownie into 1" x 1" chunks before I assembled the trifles. Usually I only cut about 1/2 of the brownie sheet for 4 trifles, and almost 3/4 for 6 trifles. Don't cut it all at once because any tiny pieces that you don't use will go stale pretty quickly, especially in the summer. I added a small spoonful of chocolate mousse to the bottom of a dessert glass and then added 2 brownie chunks. Then I layered a bigger spoonful of mousse and 3 brownie chunks. Then a another big layer of mousse and garnished it with a brownie chunk and some fresh raspberries. Perfection.